When we speak of CRM solutions today, we often use it synonymously with customer management and everything that comes with it. While it's important to find the best automation tool that cuts down time and costs, having it does not mark the end to the countless variety of customer experiences, situations and preferences you will encounter nor the end to the discovery of creative ways that make your user experience great. This article builds upon this thought that you can come into terms with CRM the strategy and CRM the tool using solutions that let you do both: formulate strategy and manage customers. The first step is to formulate buyer personas, keep learning about your target markets, and curate the kind of client relationship you want to create on an ongoing basis. The core function of CRM is contact management at a scale from a single platform. When it works for your business, it lets you quantify customer information for insightful decision-making and create meaningful long-lasting relationships. Though CRM the strategy and CRM the tool are not the same, both can go hand in hand. You can use CRM automation tools while developing and improving your customer experience strategy. So how do you go about continuously discovering your customers and learn about their experiences accurately through a CRM? We advocate using CRM integrations with email ticketing solutions to simultaneously build client relationships strategy. When you get to keep your help desk conversations and CRM contact data together, you create more opportunities to learn your customers better. It lets your sales representatives communicate and make recommendations to clients based on previous conversations, purchase history, and buyer profile. This also creates a consistent experience for customers who are directly interacting with your agents. Customer agents also get to make better recommendations to existing and potential clients. It helps to understand each customer's context and align support with sales from one platform, and provide faster and efficient service. In that way, customer reps can provide a more personal, contextual, and holistic support service that even other teams can leverage. Thus, you only have a successful CRM when you use the tool not just for collecting, store, and organizing information. But you go beyond to use this enormous information of your users and apply it in individual customer interactions and in business decisions. 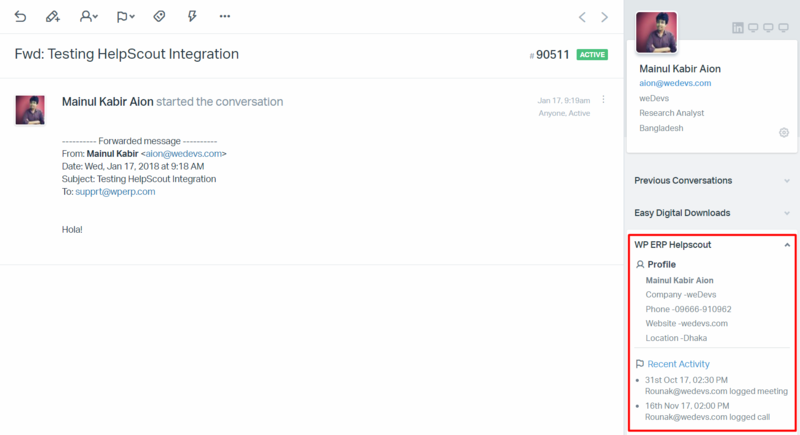 The WP ERP-Help Scout Sync is an API integration that automatically connects your Help Scout tickets to your WordPress CRM system so that you get to view conversation history from each contact profile. Help Scout is one of the best known SaaS-based shared email inbox and customer support solutions that also comes as a WordPress plugin and intuitive features. When users contact your support, tickets are generated that agents can directly reply to or assign to another representative. WP ERP's integration with Help Scout puts customer information right where you need it. You get to integrate your CRM module seamlessly with your Help Scout account with using this extension. And then pass the Help Scout data on to your CRM Contacts as well as see essential CRM data on Help Scout tickets. With Help Scout Sync for WP ERP, small businesses can better manage their clients. Staying ahead with customer history just got easier! If you are running an eCommerce marketplace, a software firm, or an advertising agency, chances are you are dealing with several different clients. Whenever you are directly dealing with clients, you need something to easily juggle all the information of each one of them. The Help Scout CRM Sync is a two-way integration. It will let you view your customer data and help desk support tickets altogether on both platforms so that you can simultaneously manage both your CRM and Help Scout. So you can view client profiles that you created on CRM from Help Scout and view Help Scout tickets from your CRM directly. 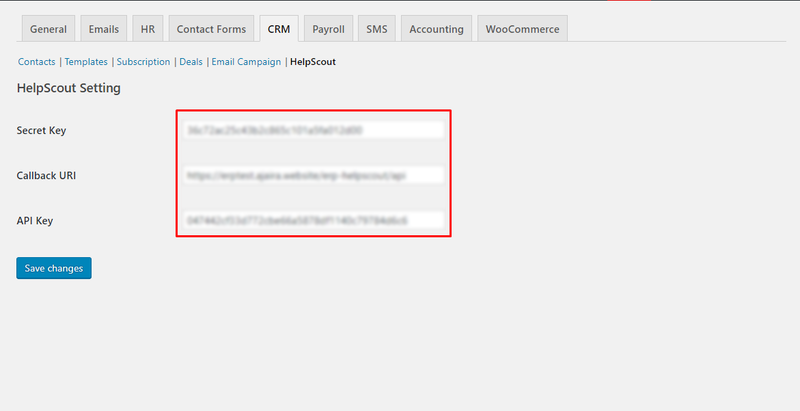 You can display Help Scout Ticket List on every contact's profile in your WP ERP CRM. You can view WP ERP CRM user profile details on your Help Scout tickets. On Help Scout ticket you can view your WP ERP user profile details, such as company, phone, website, location. And even view agent interactions with users, such as meetings and calls. The extension automatically adds New Contacts to CRM from Help Scout when a ticket is submitted. Automatically integrates previously generated Help Scout tickets with CRM. The integration will help small businesses to transform Hep Scout into a full-fledged CRM and do more with Help Scout contacts. It adds more client management functions on both platforms. Serve customers better and gain happier users. Simply download the ZIP file for the Help Scout CRM integration from your Account page, like you would for any other WordPress plugin. Upload it to your WP Dashboard->Plugins directory. Now Activate the plugin. The next step is to configure the integration from your Help Scout account. 3. Login to your Help Scout Account and choose Apps from Manage located on the top menu. Now search for the custom app and select the result. 4. Click Create App from the left side. 5. Now insert WP ERP in the App Name field on the form. 6. Choose Dynamic Content from Content Type drop-down. 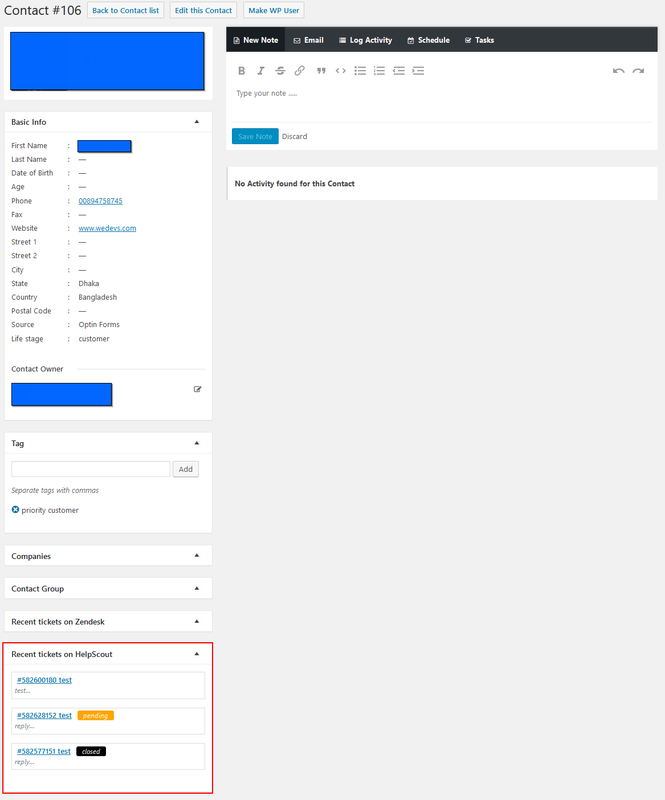 Insert Callback URL and Secret Key found from WP ERP settings page (WP Dashboard-> ERP Settings->Settings->CRM->HelpScout). 7. Check the Mailboxes you want to use and hit Save. 8. Now on Help Scout from top right menu choose your profile (step 1 shown in the image below). From the left side menu choose Authentication (step 2). Now from “Help Scout API” section hit “Generate an API Key” button (step 3). 9. Copy generated API key. 10. Insert the API Key field on ERP Settings page found from ERP Settings->Settings->CRM->HelpScout. This completes your WP ERP Help Scout Sync! Whenever a user or client submits a ticket, the sync will happen automatically on both platforms. You are now ready to make happy clients. 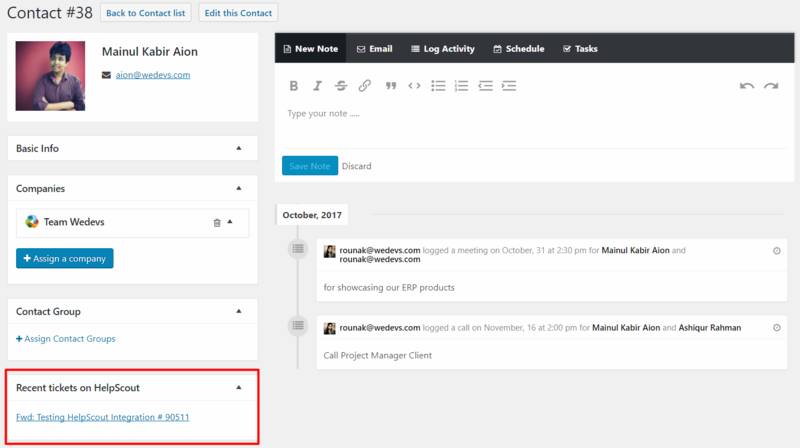 You can view the status of the tickets, the subject and preview of the emails from your WP ERP CRM. Thus, getting an instant idea about the customer's interaction with the business or his purchase history or the issues he has faced with products/services. Too often businesses get too bogged down on the tool itself before forming a customer-centric business strategy that identifies buyer personas and the real problems your users face instead of trying to use the tool to continually develop the customer experience strategy. 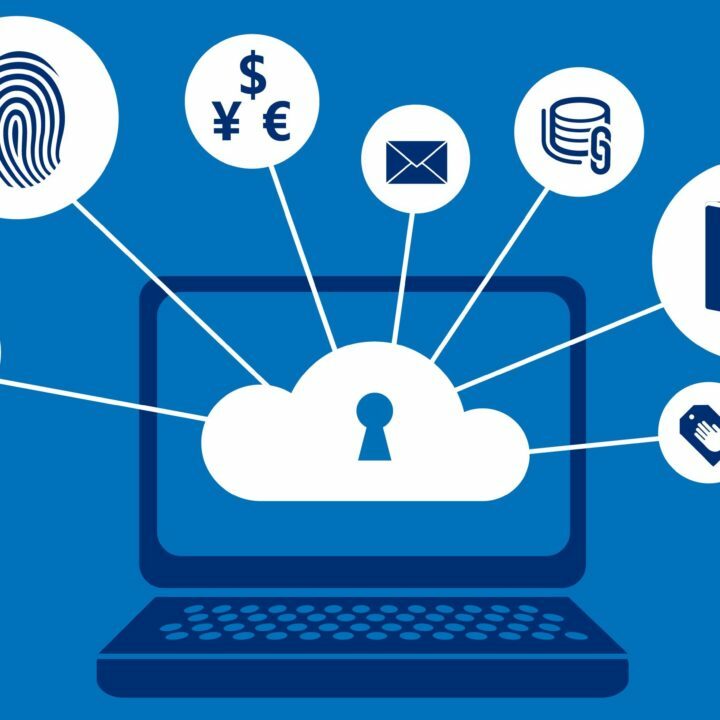 Help Scout integration with WP ERP CRM is a solution that lets you put your customer information right where your agents need it. It's a great customer support solution when you want to contextualize and create human-like interactions with your clients through the screen. The extension lets you create meaningful interactions with clients that place each contact's situation into perspective. Because you can view the entire client history and their issues/tickets from a single page. So you can add a personal touch to every interaction with users and customers instead of making things robotic like the usual way. In this way, you can make every support interaction more human. This creates a more complete and unique experience for both agents and clients. Thus making it feel real and enjoyable! Try WP ERP-Help Scout Now! To view the guide to install and configure WP ERP-Help Scout, check here.